250 Beacon is located on the north side of Beacon, between Dartmouth and Exeter, with 246 Beacon to the east and 254-256 Beacon to the west. 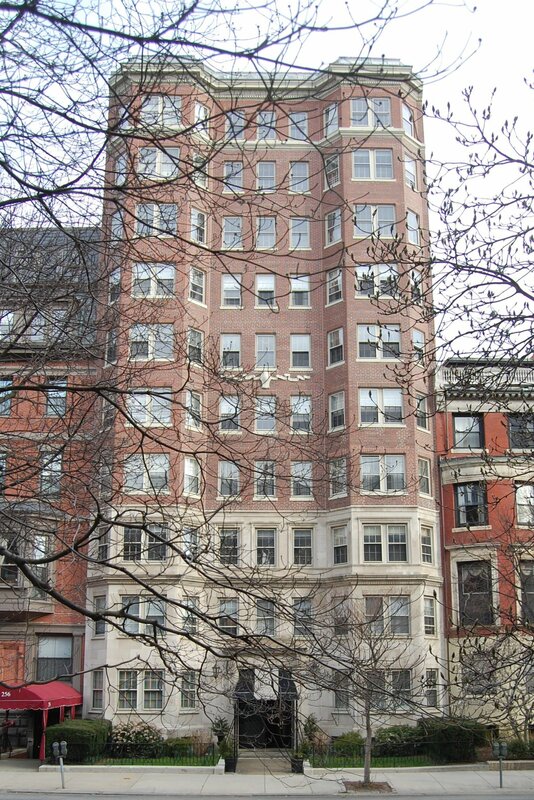 250 Beacon Street was designed by architect George Nelson Jacobs and built in 1925-1926, a ten-story apartment building built for 250 Beacon Street, Inc.
250 Beacon was built on the site of two existing townhouses, at 250 and 252 Beacon. On September 4, 1925, both houses were acquired by the Kilsyth Realty Trust, which had been formed on April 28, 1922, by William W. Cherney, a heating contractor, and David Carlin, a plumbing contractor, both of whom lived in Winthrop. The Trust is shown as the owner on the applications for permission to demolish the two houses, dated September 8, 1925, and on the original building permit application for the new building, dated September 25, 1925. Click here for an index to the deeds for 250 Beacon. On November 12, 1925, the Trust transferred 250-252 Beacon to 250 Beacon Street, Inc., which William Cherney and David Carlin had formed to hold the property and build the new building. William Cherney was president and David Carlin was treasurer of the new company. On January 15, 1926, 250 Beacon Street, Inc., entered into an agreement with the American Trust and Safe Deposit Company, as corporate trustee, and Harold A. Moore, as individual trustee, both of Chicago, to act as trustees for $500,000 in mortgage bonds to finance the project. 250 Beacon Street, Inc., defaulted on the bonds and on March 28, 1927, the mortgage was foreclosed on behalf of the bond holders. 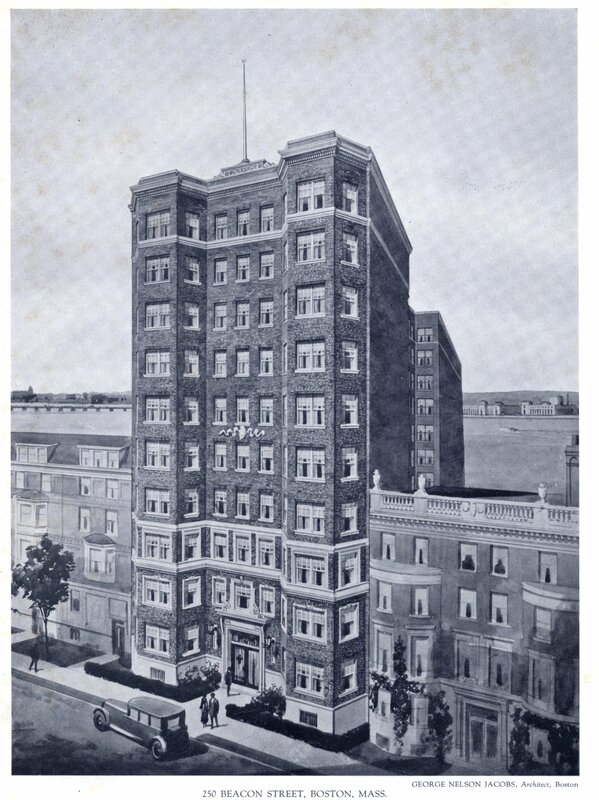 The first residents moved to the building in mid-1927; it was first listed in the 1928 Blue Book. After several years of financial difficulties, the ownership was restructured and on April 7, 1931, the property was transferred to Philip G. Willard as trustee for the bond holders participating in the restructuring. On January 14, 1932, Philip Willard registered the title for the property under the name of 250 Beacon Street, Inc., and two days later, on January 16, 1932, he filed a transfer certificate changing the name to the 250 Beacon Street Company. From the 1930s, the building was managed by the Nordblom Management Company, a real estate investment and management firm. It continued to manage 250 Beacon in the 1960s. On February 26, 1973, the 250 Beacon Street Company converted the property into twenty-one condominium units, the 250 Beacon Condominium. The legal occupancy had never been increased from nineteen units and the discrepancy was subsequently noted by the Building Department. In April of 1986, the condominium association filed for (and subsequently received) permission to increase the number of units to twenty-one. 250 Beacon replaced two townhouses at 250 and 252 Beacon. 250 Beacon was designed by architect John Lyman Faxon and built in 1887-1888 by Charles O. Wentworth, mason, as the home of Mrs. Georgianna (Georgiana) Brackett (Messer) Parsons, the widow of merchant William Parsons, and their daughters, Georgianna (Georgiana) Parsons and Martha Parsons. Georgianna B. Parsons is shown as the owner on the final building inspection report, dated August 13, 1888. They previously had lived at 181 Beacon, where they were living at the time of William Parsons’s death in July of 1885. They also maintained a home in Roxbury Highlands. Bainbridge Bunting’s Houses of Boston’s Back Bay indicates that 250 Beacon was designed by Peabody and Stearns. However, the building inspection report identifies the architect as J. L. Faxon. The land on which 250 Beacon was built was purchased from Frederic Amory on January 22, 1887, by Georgianna B. Parsons and her daughter, Georgianna, each with an undivided half interest. It was part of a parcel originally purchased from the Boston and Roxbury Mill Corporation on October 20, 1863, by Lydia (Gray) Ward, the widow of merchant and banker Thomas Wren Ward. On November 15, 1887, Georgianna Parsons’s other unmarried daughter, Martha Parsons, was added as a co-owner. The original land deeds specified the party wall obligations of the purchasers to pay for half the cost of each shared wall built at either end of the property and governed the wall to the west between 250 and 252 Beacon. The wall to the east between 246 and 250 Beacon was subject to a separate party wall agreement between Mary West and Frederic Amory, entered into when she purchased the lot for 246 Beacon on January 10, 1887. On November 10, 1887, the Parsonses paid Mary Nash, owner of 252 Beacon, for half the costs of the western party wall, and on March 13, 1888, they paid Mary Endicott West, owner of 246 Beacon, for half the cost of the eastern party wall. Martha Parsons died in May of 1899. By 1899, Mrs. Parsons had been joined by her grandchildren, Mark Hopkins, III (a student at Harvard) and Georgeanna Hopkins, children of Mark Hopkins, Jr., and Lucy (Parsons) Hopkins (Lucy Hopkins had died in August of 1883 and Mark Hopkins, Jr., was living in France). Mark and Georgeanna Hopkins had lived at 285 Beacon during the 1897-1898 winter season. At about this same time, Mrs. Parsons also was joined at 250 Beacon by her grand-niece, Constance M. Hepworth (she was the daughter of Samuel Shaw Hepworth and Anna Maria Messer; Anna Maria Messer was the daughter of Georgianna (Messer) Parsons’s brother, William Messer). Georgianna B. Parsons died in March of 1901. After her death, her daughter, Georgianna, continued to live at 250 Beacon, joined by her niece, Georgeanna Hopkins, and her cousin, Constance Hepworth. Her nephew, Mark Hopkins, left Harvard and moved to Texas to work on a cattle ranch. Georgianna Parsons died in July of 1903. Georgeanna Hopkins and Constance Hepworth continued to live at 250 Beacon. Constance Hepworth continued to live there until about 1904, when she moved to Yonkers to care for the children of her sister, Ada (Hepworth) Waring, who died in November of 1904 (she was the former wife of Chester Crosby Waring). Georgeanna Hopkins continued to live at 250 Beacon until about 1907. The estate of Georgianna B. Parsons continued to own the house and lease it to others. 250 Beacon was not listed in the 1908 and 1909 Blue Books. In 1909, 250 Beacon was the home of retired merchant Melancthon Woolsey Borland, a widower. He had lived at 393 Marlborough in 1908. He died in February of 1909. During the 1909-1910 winter season, it was the home of Miss Rose Linzee Dexter. She previously had lived at 18 Exeter with her father, William Sohier Dexter, until his death in September of 1908. By 1911, she had purchased and moved to 400 Beacon. By the 1910-1911 winter season, 250 Beacon was the home of Carl Pullen Dennett and his wife, Marie (Griffin) Dennett. They previously had lived in Bangor, Maine. Carl Pullen Dennett was vice president of the Griffin Wheel Company, makers of railroad car wheels (his father-in-law, Thomas A. Griffin, was the Chairman of the Board). Following World War I, Carl Dennett had served as American Red Cross Deputy Commissioner to Switzerland in charge of finding and caring for American prisoners in German camps. Upon his return, he became a trustee and banker in Boston, serving as president of the General Capital Corporation. They continued to live at 250 Beacon during the 1917-1918 winter season, but had moved to 332 Beacon by the 1918-1919 season. 250 Beacon was not listed in the 1919 and 1920 Blue Books. By the 1920-1921 winter season, 250 Beacon had become the fraternity house of the Boston University (Alpha Zeta) chapter of Lambda Chi Alpha. It had been located at 283 Newbury in 1920. It continued to be located at 250 Beacon in 1924. On September 1, 1925, the estate of Georgianna Parsons sold 250 Beacon to May Forman. She had purchased 252 Beacon in June of 1925, and on September 4, 1925, she transferred both properties to William W. Cherney and David Carlin, trustees of the Kilsyth Realty Trust, who subsequently razed both houses. 252 Beacon was built in 1870 for real estate developer Henry Bigelow Williams, one of five contiguous houses (252-254-256-258-260 Beacon) built for speculative sale. Bainbridge Bunting, in the Appendix to his Houses of Boston’s Back Bay, does not indicate an architect for 252-260 Beacon. However, in the introduction to the Appendix, he notes that “subsequent to the second printing of this book in 1968 the attributions to important architects of several early Back Bay houses have been brought to my attention by friends.” Among these, Bunting indicates that, “from a sifting of mountainous drawings and office correspondence now in the possession of the Boston Public Library, Wheaton Holden has been able to identify that 254-260 Beacon were designed by Peabody and Stearns. Inasmuch as 252-280 Beacon were built as a unit, this would imply that 252 Beacon also was designed by them. Click here for in index to the deeds for 252 Beacon (Demolished). 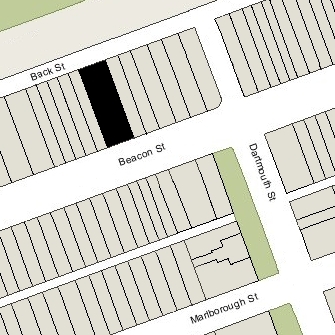 The land on which 252-260 Beacon were built was owned by Samuel Frothingham, part of a larger parcel originally purchased on December 15, 1863, from the Boston and Roxbury Mill Corporation by attorney John Duncan Bryant. On December 29, 1870, after the houses were completed, Samuel Frothingham sold Henry Williams the land (“that lot of land on which said Williams has erected at his expense five dwelling houses”). Samuel Frothingham was Henry Williams’s father-in-law. He and his wife, Maria Louisa (Whitredge) Frothingham, lived at 317 Dartmouth until his death in December of 1872. Henry Williams and his wife, Sarah Louisa (Frothingham) Williams, lived with them; Sarah Williams died in July of 1871 in a carriage accident. On July 1, 1873, 252 Beacon was purchased from Henry Williams by Benjamin Chew Tilghman. Benjamin Tilghman served in the Civil War and was brevetted a Brigadier General of Volunteers for his service. In about 1870, he invented the sandblasting process, and in about 1880 he invented the sulfite method of fiber reduction for use in manufacturing paper. He lived in Philadelphia and appears never to have occupied 252 Beacon, which was not listed in the 1876-1884 Blue Books. On December 4, 1882, 252 Beacon was purchased from Benjamin Tilghman by Mary Pratt (Cooke) Nash, the wife of Bennett Hubbard Nash. They previously had lived at 62 Boylston, where they continued to live during the 1883-1884 winter season, moving to 252 Beacon thereafter. Bennett Nash was a professor of Italian and Spanish at Harvard. Professor Nash died in July of 1906. Mary Nash continued to live at 252 Beacon until her death in January of 1925. On June 1, 1925, the estate of Mary Nash sold 252 Beacon to May Forman. On September 1, 1925, she purchased purchased 250 Beacon, and on September 4, 1925, she transferred both properties to William W. Cherney and David Carlin, trustees of the Kilsyth Realty Trust, who subsequently razed both houses.